I'm stealing brw1982 idea of a journal. I've noticed an increase of enthusiastic sniffers on this forum, so I think a journal where we can share our progress, accomplishments, and training techniques would be fun and very helpful. Please feel free post as many times as you want, ask any question regarding the sport of Nose Work (which can include tracking, NACSW, and the Canadian version SDDA). So, how is everyone doing today? I'm so happy that I got Brandy into nose work. I actually started a "real" journal and it's already been fun to go back and re-read the entries from our first few classes. Brandy was such a mess at first, she was so nervous she peed on the floor. I was scared that I made a mistake and that maybe we shouldn't even go on. Thankfully my instructors and everyone here talked me through and we just passed our first ORT this weekend. You can teach an old dog new tricks! It's been so much fun watching her grow and gain confidence! Can't wait to continue our training and see what the future holds! "In a perfect world, every dog would have a home and every home would have a dog." Last edited by Meldrew79; 11-19-2013 at 09:18 AM. I'm so glad to hear Brandy enjoying the sport, it's very addictive! Chase and I started out self teaching. For a year we would just use food and find that, I had no clue you could use essential oil as the target scent. I then decided to find a class in Toronto. Do you know how hard that was? For another year I spent looking for someone who taught Scent Detection. This year I stumbled upon Doggone Right, who uses nothing put positive reinforcement and had a 6week course lined up. We used the method of pairing a scent to food. It took Chase two weeks to finally 'commit to the scent'. After the 6 weeks I wanted to do scent detection competitively, so I reached out to the SDDA community. From then on I have been watching their posts and opinions on training and handling. One suggested the cocktail method, where we put all three scents in one container. We then just walk our dog into the room and wait for them to investigate the container, we reward and praise any interest in the container. The founder of SDDA explained that dogs are very smart when it comes to their nose, and they can smell each scent in that container. By allowing them to stumble upon the container and shower them in praise and treats, can build a strong commit to scent, where a dog wants to find the scent because that is a trigger for good things. I decided to try the cocktail method. It's like magic. It took Chase less than a week to commit to all three scents, and he can now identify each one in a DOT (ORT). Doesn't nosework in Canada use different scents than nosework in the US? Seems to me I remember at least one difference. Yes, NACSW uses Birch, Clove, and Anise. SDDA uses Wintergreen, Pine, and Thyme. The methods, and techniques used can be interchangeable since it's only the scents that are different. There are some handlers who compete in both venues, and successfully trained their dogs on all 6 scents. I've been taking Maiya to NW classes for 3 years. She just titled in NW2 recently. Gio's NW training has been more spotty because we were concentrating on conformation training. He just passed his birch ORT on Sunday. The day before Maiya and I trialed, I volunteered at the other NW2 trial (videotaped one of the search elements all day) and last year I was the timer for the exterior search at a trial. Watching other teams work at trials was a valuable learning experience. Looking forward to reading other people's experiences with this sport. Titles: too many to list! berlin's passed all her ORTs for NACSW - she was entered in NW1 earlier this year but I had to pull her from 2 trials we got into, and one trial we were waitlisted, because of her knee surgery. She's 14 weeks post-op and we are FINALLY entered for our NW1 on Sunday 12/1!!!! I'm nervous- we're also missing classes because I'm going to wisconsin and showing the other dogs in obedience, but I am taking berlin and going to do searches when i can! im most nervous about her exterior - berlin doesn't like people popping out and if she can see people or god forbid a dog in the distance, she can go into full alert mode. it will all depend on the situation. i just got an email about a nosework camp next year - id be into it but im not sure berlin would appreciate it - dogs need to wait quietly in a car when not working (HA) and be ok with large crowds watching them. 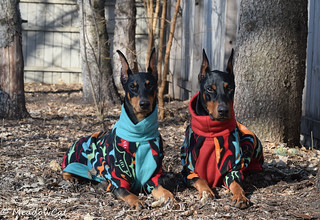 Good luck on your NW1, doberkim and Berlin!!!! Where will you be in WI? Can you guys point me to any good online resources for nosework? The closest class to me is over an hour away with mild traffic (and there is NEVER mild traffic). I think this could be fun for Perrin, especially. Aura's Zatanna Abra AKC ptd. The nearest class for me now is 3 hours away, but the SDDA group is very helpful, it's like having your own personal trainer. I think buying the scents, and finding a group with trainers in it can go a long way. I know it's not NACSW, but the levels, and training techniques are similar and there are NACSW people on there. Here is NACSW, but not many people post questions, so it doesn't really help in your situation. Denise Fenzi's online academy is offering an intro to Nosework class this session. She offers 3 levels of enrollment in her courses: 1) gold where you take videos and get feedback from instructor, 2) silver where you don't do video but can ask questions and 3) bronze where it's like you are auditing - no videos and no questions. The enrollment window opens this Friday at 9am PST and classes start Dec 1. Her gold and sometimes even silver spots fill up super fast (like sometimes in an hour!) so if you are interested be prepared to sit in front of a computer and enroll right at 9am PST this Friday! There are higher levels of Nosework they offer too, it sounds like this is the beginning class for newbies. I thought about entering Lucy in this but we have too much on our plate. I'm enjoying hearing about everyone else doing their nose work though! Thank you!!!!! This sounds like a perfect winter activity. Im definitely signing up. I have a question for those of you that have some experience. What are y'all using as an indication? For tracking, I've trained a down for articles. Would that be acceptable in nosework also, or do they need to paw at it or otherwise touch it? In SDDA they say to allow your dog to indicate in their own way. Pawing, biting, or physically moving the hide can DQ you. Chase has this VERY obvious indicator, all it is is him whipping his head around to look at me. If I pause, he goes back to the hide, points with his nose, and play bows or sit. As long as the indication is clear as day to the judge, it can be anything. The same applies to NACSW - the advice is to allow your dog to indicate in their own way. Over the last couple of years, Maiya has added indicators as our training progressed. She started out indicating by turning her head around to look at me but now also paws and nose touches. With pawing, you could get a fault if there is damage (depends on the judge) but you are allowed a certain number of faults in a trial so I'll take the pawing for now. At NW1 and NW2 trials, you are allowed to list up to 3 indicators on the trial entry. But if your dog doesn't indicate with one of those 3, you can still call an alert. The judge may ask you "where?" (where is the source?) especially for NW1 trials and you need to be able to point to the source. But even when Maiya has clearly indicated to me with one of our 3, I have been asked to point to the source by a judge. Again, depends on the judge. I need to look up the rules about indicators for NW3. I've heard that the Parker Videos (on DVD) is a good resource - especially if you are just starting in NW. Christy and Parker were at the DPCA National last year and demoed at the Breeders workshop. in nosework your dog can have elevated hides - in that instance, a down can be a detriment for some dogs since it can take them from the source of the odor (in some ways, very far, especially if its an inaccessible hide) so for me i like the dogs nose to be where the odor is but again, i haven't trained an indication for this - i am letting her tell me. 1.5 years in, she nose touches, head turns, and occassionally paws. I love Nosework! Richter passed his ORT on birch a few weeks ago. Right now we are on a break both because I'm doing too many things (obedience and agility) and because there are no Nosework trials close by yet. I hope to get back into it soon, because Richter really enjoys it. “You cannot get through a single day without having an impact on the world around you. I've finally found out some more about UKC nosework. They are going to be using a total of five scents. I think that this Leerburg | UKC Nosework Kit is what I will be buying when we get our income tax return. I have a question for people who have trialed for some time. This is my very first trial, so I've been reading the manual book and asking a bunch of questions about what to expect. The host/chairwoman of the trials posted a message on the group forum stating that there has been two diagnosed kennel cough cases in the area. She also mentioned that the two dogs are still going to compete. The executive of SDDA has been contacted and has spoken with the host about the issue, but no further information has been released. Is it normal to allow contagious dogs to compete in events? Someone who has been trialing for quite some time said it is normal, and all she does is keep her dogs separated from her household dogs to stop the spread of disease. I have a feeling the executive of SDDA has requested those dogs to be pulled, as the manual does state that any dog who is sick and cannot perform the trial will be DQd, but i need to wait for the official email. Just bumping this, it's been a couple of days and the host has not made a decision yet. I have a 13 yr old lab at home, I find it's too risky to let Chase compete alongside a contagious dog that he may pass it on to the lab. Bummer about the trial I'm surprised they would allow the sick dogs to compete...you would think the risk of losing the competitors that don't want their dogs exposed to the sick ones would be a good enough incentive to not allow them to compete. Guess not! I have officially signed up for the Denise Fenzi online course and purchased the Leerburg nosework starter kit. I am really excited to get this started! Last edited by AuraDobe; 11-25-2013 at 10:30 AM.